Vector Data Systems owns and manages most of the facilities used to deliver services to our customers. This allows us to keep our promise of delivering the best uptime and support. Unlike other providers that resell services from a wholesaler, or rent space at colocation centers, we keep as many of our core services as possible in-house. The companies we do partner with are chosen carefully to ensure the best possible experience for our customers. Vector owns all of the hardware used in its Microwave access network. Most of the radio gear used in our system is made by Motorola, and is chosen to adhere to strict quality standards. Equipment is installed on building rooftops and communication towers, such as the one pictured above during construction. Vector’s core network is completely redundant, with backbone links to each site operating in different frequency bands and using different technologies to eliminate single points of failure. Our microwave network is designed to stay up in all conditions- from standby power to physical security, we try to plan for all contingencies. 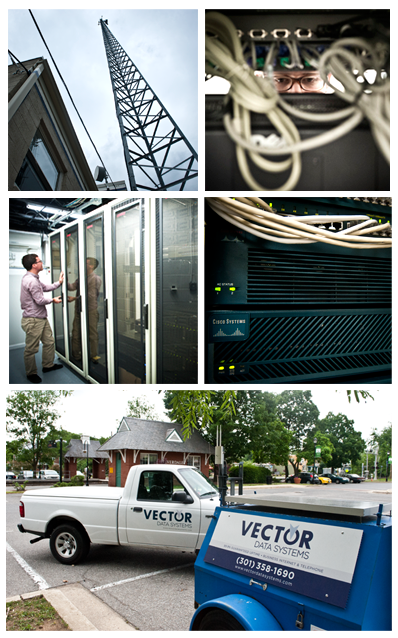 Vector’s IP routing system is built on equipment from Cisco systems- the industry standard. The core network uses dynamic routing protocols to detect and recover from hardware failures. Also, network security is a top priority. Mechanisms are in place to prevent and minimize the impact of computer worms, viruses, and malicious users.